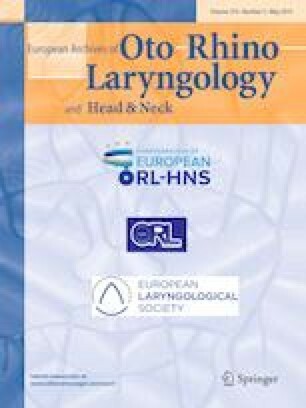 To investigate the correlation of tissue eosinophil count and chemosensory functions in patients with chronic rhinosinusitis with nasal polyps (CRSwNP) after endoscopic sinus surgery (ESS). This was a cross-sectional study including 40 patients with a history of ESS for CRSwNP recruited consecutively. Visual analog scale score and the Lund–Kennedy endoscopic score were recorded. Biopsies of the ethmoidal sinus mucosal were performed and evaluated. Chemosensory functions were measured by Sniffin’ Sticks and chemosensory event-related potentials (CSERP). The associations between chemosensory functions and tissue eosinophil count were analyzed using Spearman correlation and partial correlation after adjusting the confounding factors. Kendall’s tau-b correlation was performed between sneezing score and CSERP with ethyl alcohol (EAL) stimulation. Olfactory and trigeminal nerve function was successfully evaluated using CSERP. Postoperative tissue eosinophil count was correlated with threshold (T) score (partial correlation coefficient r = − 0.460, p = 0.012) and CSERP peak latency for olfactory (N1: partial r = 0.471, p = 0.010; P2: partial r = 0.487, p = 0.007) and mixed olfactory–trigeminal (N1: partial r = − 0.516, p = 0.008; P2: partial r = − 0.590, p = 0.002). There were also correlations between T score and N1 latency with phenyl ethyl alcohol (PEA) (partial r = − 0.560, p < 0.001), between sneezing score and N1 latency with EAL (Kendall’s tau-b = − 0.40, p = 0.005). Postoperative tissue eosinophilia is significantly associated with postoperative olfactory disorders as assessed by Sniffin’ Sticks and CSERP peak latency. Furthermore, olfaction as measured by T score correlates with olfactory ERP latency in inflammation-associated olfactory dysfunction. Trigeminal sensitivity also appears to relate to tissue eosinophilia, indicating mucosal inflammation can affect both sensory systems in the nose. TH and LZ designed the study. CH analyzed the data. WY and YW performed histopathological analysis. LZ, PH and ZS wrote the manuscript. LZ, CH, XH, DW, HS and XY collected the clinical data and followed up with the patients. TH, YW read and revised the manuscript. All authors have read and approved the final manuscript. This study was supported by the Natural Science Foundation of China (No. 81670903), the Beijing Key Laboratory of Upper Airway Dysfunction-related Cardiovascular Diseases (BZ0377), the Beijing Municipal Administration of Hospitals (No. DFL20150602), the Beijing Municipal Administration of Hospitals Clinical Medicine Development of Special Funding Support (ZYLX201605) and the Beijing Natural Science Foundation (No. 7152057). There are no financial disclosures of the authors. This study was approved by the Ethics Committee of Beijing An Zhen Hospital, Capital Medical University, and had been performed in accordance with the ethical standards as laid down in the 1964 Helsinki Declaration and its later amendments or comparable ethical standards.